I confess that I have to ease back into regularly scheduled posting today. That post-holiday haze – the feeling of lazy contentment lasts for at least a day after stuffing yourself with a huge dinner, cookies, candy canesÂ and hot chocolate, opening presents and chatting with those close to you – is not only tough to shake, but is actually pretty enjoyable. 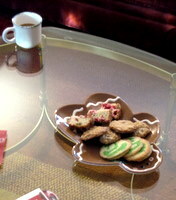 I’m moving the holiday chatter here, to virtual friends and readers. 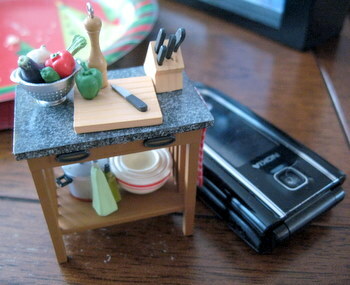 This is a kitchen island Christmas ornament from Hallmark, posed with my mobile phone so that you can get an idea of scale. It’s nearly complete – minus major appliances – but fully stocked with pots, utensils and a full vegetable collander. It’s so cute that I can’t complain that Santa didn’t quite get it right. I’ll just be more specific next year. That’s pretty funny. I got the same ornament! All the stuff you need…except miniturized. Love culinary related Christmas ornaments—thanks for sharing! I did get 6 gift cards to a local coffee shop…does that give you a clue about I truly enjoy–ha! What an incredibly cute ornament! ….oh and a KitchenAid Artisan in Red! That ornament is a riot! I love it – thanks for sharing. We didn’t put stuff in stockings this year, but a friend and fellow baking nut was given a full-size Nutcracker wearing a little apron with tools in the pockets and mini gingerbread cookies in one hand. It’s positively adorable!